Ronnie Attard made the last day of the USHL regular season extra special. 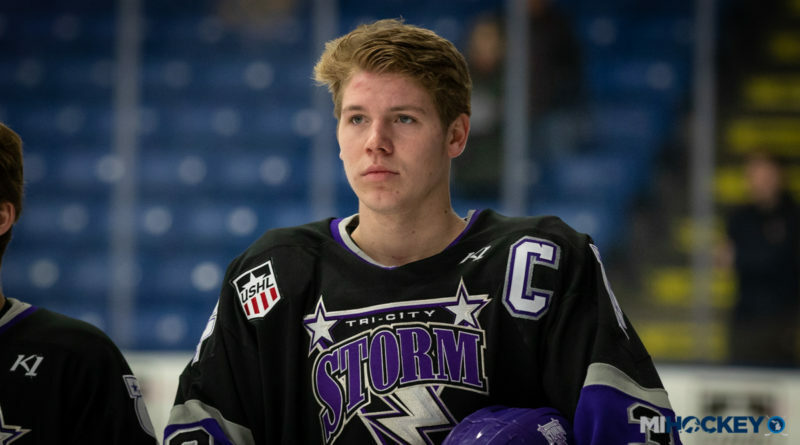 The White Lake native and Western Michigan commit scored two goals and added two assists in his Tri-City Storm’s 6-1 win over the Sioux City Musketeers. His first goal gave him the record for most goals in a single season by a defenseman in overall USHL history – he had already broken the USHL modern-day (since 2002) record earlier in the season. The points accumulated in the rest of the game gave him a season total of 64, good for the modern-day record for points from the blue line. “It’s been a great year so far, and I’m just hoping to keep it going for the playoffs,” Attard told The Independent. The Honeybaked and Victory Honda alum finished seventh in USHL scoring for the 2018-19 campaign. The third-year Tri-City blueliner – who is wearing the ‘C’ for this club this season – also finished with the best plus/minus in the league at +46. He has been one of the main reasons why the Storm are the Anderson Cup champions and the No. 1 overall seed heading into the USHL postseason.